We offer beef for sale by the quarter and side, and as our supply allows, by the cut from our freezers. Our cattle enjoy the highest quality of life, are free from medications and hormones, and move all over the farm: managing our grasslands, opening up marginal areas, and grazing cover cropped sections of our fields. Although their diet is based on pasture and stored forage, it is also supplemented with the spoils of our market gardens as well as some locally grown grain during the last couple months on the farm. 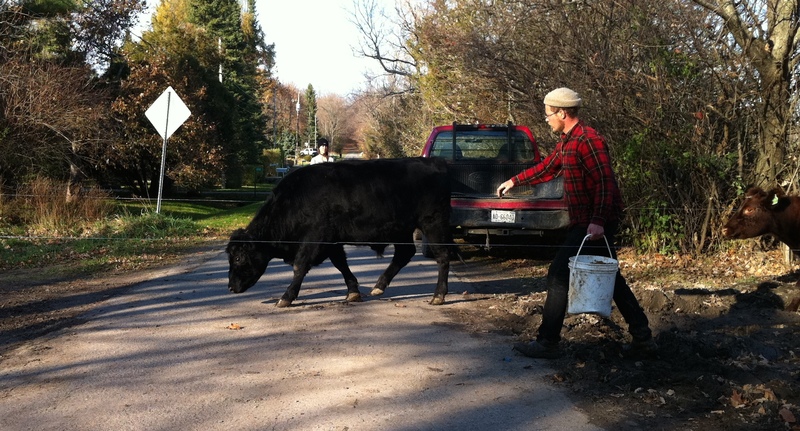 Moving cattle across public roads with a pail of beer grains… Fun! 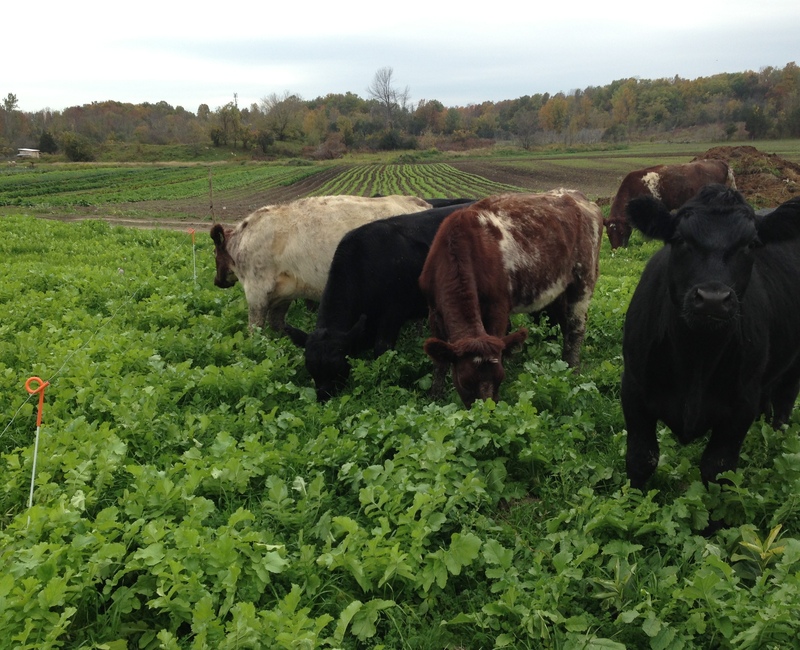 Shorthorns and Angus stripgraze a fresh break of cover crop on next year’s strawberry patch. Most of us don’t buy meat by the side: but if you’ve got yourself a deepfreeze (or are willing to invest in one), it’s a great way to have affordable, high quality food on hand all of the time. It’s not as simple as buying it from the grocery store, but it’s fairly straightforward, and in the long run, a lot cheaper. Our beef is sold by the pound @ $4.50/ based on the hanging weight, plus the butchering fees. For a primer on buying freezer beef for the first time, check out our blog post about it! Our next batch of beef will harvested in mid-November of 2019, and available in mid-December. Sign up early to ensure your supply! We ask that our customers meet us when we return from the butcher with the frozen meat: you will have notice in advance of this date. Your meat will come wrapped and frozen: we recommend coolers or sturdy containers to bring it the rest of the way home. Cattle grazing standing cover crops on a misty morning. New life means spring is around the corner! We have a small nucleus of breeding animals here at Salt of the Earth. We raise shorthorn cattle, a heritage breed from the north of England that has gone on to spawn 30+ breeds, and herefords. They respond well to grass feeding and marginal pastures, are excellent mothers and all-around easy keepers. If you’d like to purchase beef by the quarter, half or whole for 2019, please fill out the form below – thank you! We’ll e-mail you a receipt for your down payment. The balance of the purchase is due at pick-up – we will contact you in advance with the exact amount once we receive the final weights from the butcher. We sell our quarters as “split quarters” ie: not a front or back quarter, but half of a side evenly distributed in two. We will help you through the process of choosing your cutting requests. However, feel free to relay them to the butcher directly, especially if you have very specific requests. Also note that some requests need to be relayed before animals leave the farm (e.g. sweet breads). Butchering fees are subject to change. We simply pass on this cost from the butcher. HST is applied to butchering costs. All our beef is processed in provincially inspected facilities and comes to you wrapped and frozen. Please contact us if you have any questions! We’re happy to give you more information if this is your first time purchasing beef by the quarter. 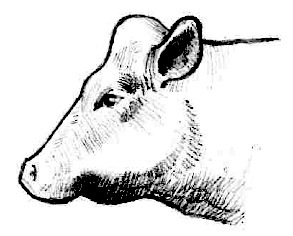 What is the ballpark cost for a 1/4 cow and 1/2 pig, knowing that the size varies. Just trying to get an idea of total cost per allotment. Hi Steven, thanks for getting in touch. I think we’ve exchanged emails with more details, but I’ll put up a ballpark estimate here for anyone else interested. The range on sides of pork for final invoices last year were $300 – $500, depending on the size and final processing. For instance, if you want all the hams/hocks/chops smoked, the butchering costs will go up. For the beef, last year our invoices ranged from $700-$1,000 for a quarter. Thanks for getting in touch!